Flag info and construction details from the official site http://www.govt.ws/gi_details.cfm?gi_id=006. 1. In this prescription the hoist of the flag from top to bottom is regarded as 144 vertical units and its breadth from side to side as 288 horizontal units. 2. Each star has its upper most point on a vertical line through its center. 3. Two of the stars are disposed with their centers on a vertical line by setting the blue quarter. The top point of the upper star and bottom point of the lower star are distant 3 vertical units from the upper and lower edges of the blue quarter respectively. 4. The star nearest the staff has its top point distant 21 vertical units from the upper edge of the flag and its nearest point distant 42 horizontal units from the edge nearest the staff. 5. The star nearest the fly has its top point distant 18 vertical units from the upper edge of the flag and its nearest point distant 42 horizontal units from the fly edge of the blue quarter. 6. The fifth star has its bottom points distant 26 vertical unit from the lower edge of the blue quarter and its nearest point distant 56 horizontal units from the fly edge of the blue quarter. 7. The star nearest the fly edge measures 15, the top most star and the star nearest the staff 16, the lowest star 20 and the fifth star 10 vertical units measured from the point of any ray to the point of the next ray but one. Coat of Arms info from same site http://www.samoa.ws/govtsamoapress/crest.htm. A silver shield with the lower two thirds blue, having thereon five silver stars representing the constellation of the Southern Cross, of the same shape and the same relative sizes and dispositions among themselves as in the Flag of Samoa; one half of the upper third depicting a green sea with a green coconut palm issuing there from; the shield being surmounted by a gold cross, and superimposed on 2 concentric circles of the world and the olive leaves as in the United Nations Badge, and bearing the subscription of the motto "Faavae i le Atua Samoa", meaning in the English language "God be the Foundation of Samoa", the whole being contained within surrounding concentric circles between which are inscribed the words " The Public Seal of the Independent State of Samoa." The protocol manual for the London 2012 Olympics (Flags and Anthems Manual London 2012) provides recommendations for national flag designs. Each NOC was sent an image of the flag, including the PMS shades, for their approval by LOCOG. Once this was obtained, LOCOG produced a 60 x 90 cm version of the flag for further approval. So, while these specs may not be the official, government, version of each flag, they are certainly what the NOC believed the flag to be. For Samoa: PMS 281 blue, 032 red. The vertical flag is simply the horizontal version turned 90 degrees clockwise. Flottes de Combat 2002 (French equivalent to Jane's) presents a photo of Samoan Patrol ship Nafanua. She flies as an Ensign a blue 1:2 rectangle with a white symbol in the middle. The scale of the photo is not sufficient to say more. 35a: yellow pennant meaning “Storm/hurricane alert. A tropical cyclone of storm or hurricane intensity exists and may affect the locality within 24 or 36 hours. Just been watching a very interesting programme on the 50th anniversary of Samoan independence. About a third to halfway through the 40 minute programme there were scenes from the 50th anniversary celebrations which included quite a large number of flags which i don't think have been reported here (sadly, they are only fleetingly seen). It appears that the jubilee had its own flag, a complicated realistic image of a vaka (outrigger canoe) on a predominantly orange background, which is also shown. The full programme can be seen at TVNZ's website here: http://tvnz.co.nz/tagata-pasifika/s2012-ep20-video-4946695 [available only in New Zealand]. 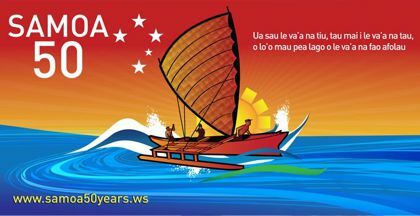 Another cloth on building is here: http://www.radioaustralia.net.au/international/2012-06-01/china-a-better-pacific-friend-than-us-samoan-pm/953518. There may well be others. This, in my opinion, is just decoration with various lay-outs of the 50-years logo.